Lawn caterpillars, the term used to group together fall armyworms, grass loopers, and sod webworms, can prove devastating to plants. August through October usually holds the largest problems for lawn caterpillars, but more frequent rains can lead to higher than normal populations. Fall armyworms range in color from green to brown and have both light and dark stripes running the entire length of their bodies. While they are young, they feed mostly on just one side of a leaf, and as they grow, they eat through the leaves and create holes. Their grasses of choice are Bermuda grass, Zoysia grass, and crabgrass, as well as fruits, vegetables, and some flowers. Sod webworms, the most damaging lawn caterpillar, are active April through November. The larvae have a brown-yellow head and are cream colored with dark spots. These pests feed on the upper surface of the blades of grass, which leaves off-color spots. As they get older, they consume entire sections of leaves. They feed mostly at night and rest during the day, laying in a curled position on the surface of the soil. The infestation of lawn caterpillars can lead to unexplained ugly brown patches in your lawn. Prior to treating for caterpillars, to make sure they are your culprit, place a damp towel over the brown patch during the evening. In the morning, lift the towel and if caterpillars are the ones attacking the lawn, they will be attached to the towel. It will be tempting to mow the lawn shorter, but this will only make the damage done by the caterpillars extremely more apparent. these lawn caterpillars lay their eggs on the grass blades, and continue mowing the lawn at a normal height. pests until they have become obvious. As you are treating, be sure to treat for them at the caterpillar stage, not the moth stage. A biological insecticide will work instead, like Grovida Dipel DF Caterpillar Wise or Margaret Roberts Biological Caterpillar Insecticide. Infested areas should be spot treated with a liquid material not a granular material, and should be treated during the early evening. The liquid sticks to the upper part of the grass blades where the larvae feed. After treating the lawn, it should not be mowed or watered for at minimum two days to avoid removing the chemical treatment. Also, do not treat a lawn if rain is expected in the next few days. 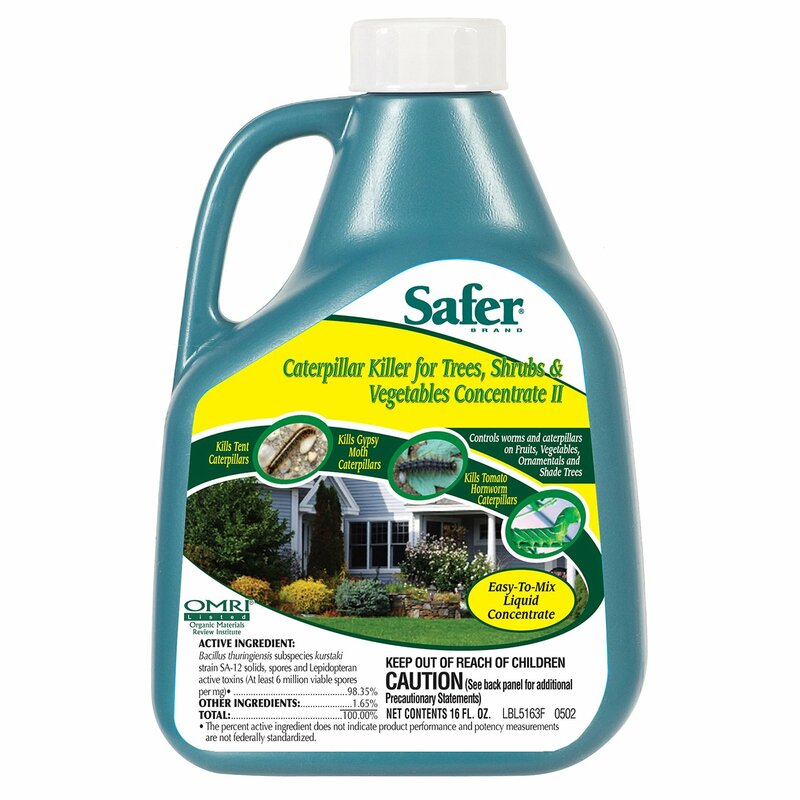 most effective on young caterpillars while still protecting other beneficial insects. BT works as a bacterium that infects and then destroys the lining of their guts. This is available at any garden shop and online. To treat large caterpillars, Spinosad (also known as Conserve) would be another option as Bt may not have an effect. Spinosad should not be used if any bees are present. Another option is to spray neem oil where the caterpillars are infesting. Derived from the neem tree, not only does this oil kill caterpillars immediately, when sprayed on things that they would ingest, it tastes so bad that the pests would rather starve than eat it. 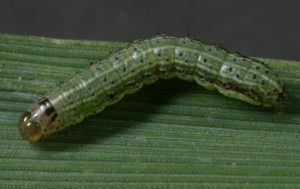 Pyrethrins are also used in eradicating caterpillars. Normally found in a spray form, brands like Take Down and Rotenone-Pyrethrin Spray are popular brands. Insecticidal soaps are other products that may be used. Safer Insecticidal Soap and Garden Safe are known brands, and these work by dissolving the cuticle (protective layer) of insects and destroying the cell membranes and cause the cell membranes to spill out.